Posted in Amish Blog, Happenings on March 9, 2013 by Gordy Harrower . While the Strasburg Spring Auction two weeks ago started with drizzle and colder temperatures, today’s weather for the Gordonville Mud Sale was absolutely gorgeous – sunny skies and temperatures approaching 50 degrees. And the warm temperatures brought out the crowds for what promised to be a beautiful day. The Gordonville Fire and EMS Co. is located along Leacock Road between Route 340 and Route 30, just north of Paradise, PA. Both sides of Leacock Road were packed. On the west side were the auctions for many outdoor items – farm implements and farm equipment, bikes, lawn mowers and spreaders, swing sets, Amish buggies, and more. There were crowds gathered around five or six different auctions going on simultaneously in different sections of the field. Across the street in the fire company building and three or four large tents (set up just for this occasion) were auctions for crafts and quilts, antiques, tools, and furniture. 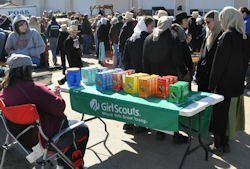 Plus, there were outdoor sales for food, drinks, fresh produce, and Girl Scout cookies (it’s that time of year!). Actually the Gordonville sale kicked off Friday night with additional auctions of quilts and craft items. The beautiful weather made this auction picture perfect. 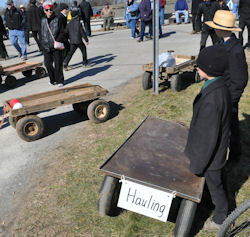 And the Amish boys were out with their four-wheeled carts, helping people haul their newly acquired treasures back to their vehicles. We also have information, photos, and video footage available from the Strasburg Spring Auction. You can check out our Lancaster Events Calendar for a full list of other upcoming Lancaster County events.